Here are the basics about Alex Blaszczuk: She lives in Manhattan. She's 26. She has a 20 pound cat. She's a third year law student at Columbia University. And about 18 months ago she broke her neck. Blaszczuk (pictured) sometimes jokes that she wishes she'd done it bungee jumping. At least then she says she would have a better story. "It was interesting. In the rehab floor I was on, I was the only woman because everyone is usually injured doing some kind of fun, extreme sport or diving," she says. Blaszczuk was rear-ended by a car. Spinal injuries are quirky. And in many ways, Blaszczuk says she's lucky. She isn't on a ventilator. She can move her shoulders. Still, the accident left her unable to do some of things she used to take for granted — things she loved, like taking pictures, turning the pages of her law school text books, writing with a pen, walking. "I'm not that techie, but I have a lot of friends who are, and especially since my injury I feel like I get 15 e-mails a day that are like 'Have you heard about this crazy new thing that might help you?' " Blaszczuk says. Many new technologies today promise to give us all superhero-like powers. We live in a world where endless facts and figures are at our fingertips. Self-driving cars promise that soon even your spouse could have an unerring sense of direction. 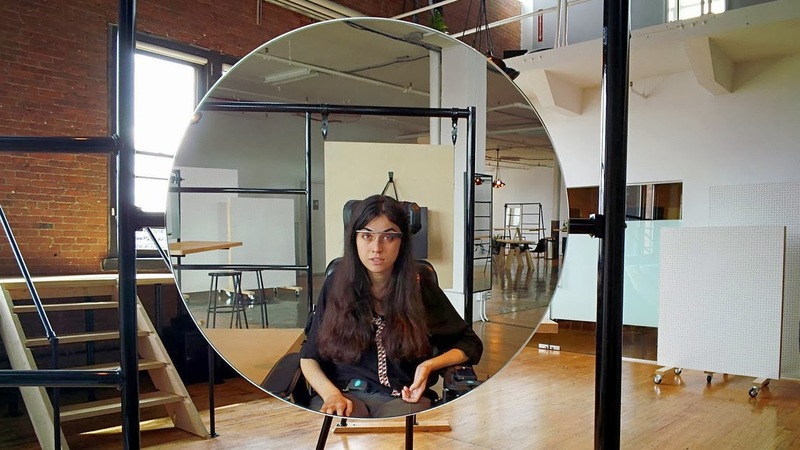 For the disabled, this kind personal, high-tech augmentation could open up new worlds — but only if the technologies are designed to be accessible. And many companies have yet to embrace the commercial opportunities. Still, for Blaszczuk, technology has at times been liberating, like when she got an iPhone. "It opened the world for me because the touch screen technology is the only way I read books, the only way I read anything," she says. Touch screens and voice controls have allowed her to continue working toward a law degree. Next year, these devices will help make her legal practice possible. Apple has made a huge effort to make all of its products from the smallest iPod nano to the Mac accessible. And for Blaszczuk, that's made an enormous difference. When Google started selling to a select few "explorers," Blaszczuk's friends came over and insisted she try to get a pair. And she did. "Right after I got it, I went to London," Blaszczuk says. "I went for a wedding, and I actually caught the bouquet. I had Google Glass on, and the bouquet landed in my lap." She filmed the entire thing. The voice activated controls have allowed Blaszczuk to start taking pictures again. She filmed a what she called a "rolling" tour of Brooklyn. Google encouraged her to take Glass on a camping trip. Blaszczuk uses Google's Internet-connected glasses to talk on the phone with her grandmother and to search the Internet with voice controls. "Voice activated technology has a long way to go, including Glass," she says, "but if I could talk to an appliance in my house, if I could say 'OK, lamps, turn on,' that would be a huge change." Today it's possible to wire a house to respond to your voice. But it's expensive. And when Blaszczuk fantasizes about the kinds of technologies she wants, item No. 1 is robotic limbs. "There is a lot of cool stuff that is already happening in robotics I think that allows people who don't have use of their limbs to use robotic limbs," she said. While it's possible that an affordable system might soon allow Blaszczuk to talk her lamps or her stove or other appliances in her house, the robotic exoskeleton seems like a distant dream. There are just too few people who both need it and could afford it to make it commercially viable. "People with disabilities are going to continue to be a very small percentage of the marketplace," says Corbb O'Connor, a consultant who works with companies to improve accessibility for the blind and other users with disabilities. "Companies don't see people with disabilities as a big piece of their marketshare," O'Connor says. While that is true, O'Connor says ignoring accessibility issues completely is a multi-billion dollar mistake. The National Federation of the Blind has been pushing Amazon to make its Kindle e-readers fully accessible to users with visual impairments for years. When school districts and universities have contracted with Amazon to provide Kindles for class, NFB has sued. These conflicts have given Apple a big advantage in the education market even though Amazon's tablets are much less expensive. Recently, Apple closed a deal with the Los Angles public school system to spend $1 billion buying iPads for its students over the course of several years. "The National Federation of the Blind and I keep pushing these companies to say, 'Look, Apple is still a profitable company,' " Corbb says. "They are clearly not losing money on all these blind people buying their iPhones. And as they've seen, actually, the accessibility features of an iPhone are not limited to blind people. You have quadriplegics who can use them, you have people who are autistic who are finding ways to use them, you have people how have hearing impartments that are using iPhones, all with just a little bit of extra software that's is already built into every single Apple product." And Corbb says that's just beginning. Making technology accessible often makes it better. Siri's voice seemed novel to millions us just a few years ago. "Well, the voice was Karen [Jacobsen]. Blind people have been listening to Karen's voice for at least 25 years as robotic speech," Corbb said. He says more often than not the technologies that really blow us away – that have the potential to change the way we live — are accessible by design. Think about a self-driving car and what it promises to do for Corrb – who's blind — or Blaszczuk in her chair. For the disabled, innovations like that could be liberating. But as Corrb points out, it could pretty awesome for the rest of us, too.